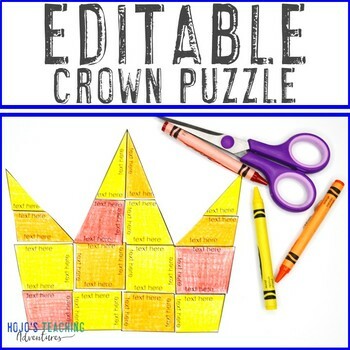 Let your students practice various skills with this fun EDITABLE Crown Puzzle. 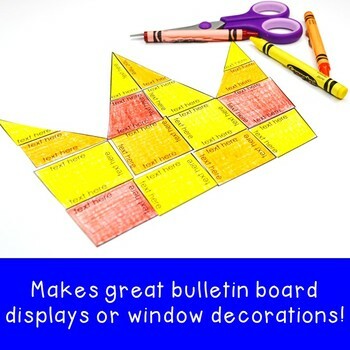 These are a great way to engage students on various tasks. Use them as a gift for Mother's Day or as part of a "royal" theme. 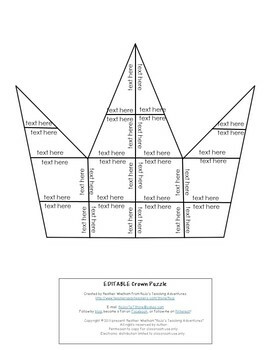 This puzzle will have students match 20 different problems together by correctly putting the 16 piece crown together. You need to create the puzzle, so it will fit the needs of YOUR students! Teachers in 1st, 2nd, 3rd, 4th, 5th, 6th, 7th, and 8th grade have used this puzzle with success. Check out the preview file and video. This is a PDF, but it will help you understand how the puzzle works and whether it's right for your students. You get one puzzle in this download. It is an editable puzzle with 16 pieces. 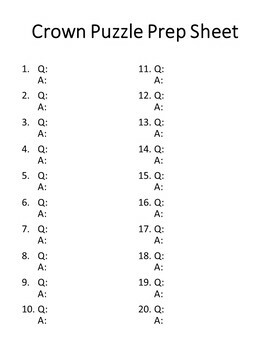 You will make the 20 problems to fit the skill/s your students need to focus on. You can keep changing the problems to use this puzzle over and over again. Use these puzzles anytime you need a fun activity - particularly for Mother's Day.